"BUFFALO BILL" IN THE VATICAN. With His Indians and Cowboys He Celebrates the Pope's Anniversary. Special Cable in The New York Herald. 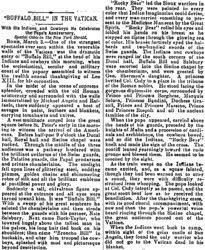 ROME, March 3.—One of the strangest spectacles ever seen within the venerable walls of the Vatican was the dramatic entry of "Buffalo Bill," at the head of his Indians and cowboys this morning, when the ecclesiastical, secular and military court of the papacy assembled to witness the twelfth annual thanksgiving of Leo XIII. for his coronation. A vast multitude surged into the great square before St. Peter's early in the morning to witness the arrival of the Americans. Before half-past 9 o'clock the Ducal hall, Royal hall and Sistine chapel were packed. Through the middle of the three audiences was a pathway bordered with the brilliant uniforms of the Swiss guards, the Palatine guards, the Papal gendarmes and private chamberlains. The sunlight fell upon lines of glittering steel, nodding plumes, golden chains and shimmering robes of silk and all the brilliant emblems of pontifical power and glory. Suddenly a tall, chivalrous figure appeared at the entrance and all eyes were turned toward him. It was "Buffalo Bill." With a sweep of his great sombrero he saluted the chamberlains and then strode between the guards with his partner, Nate Salsbury. Next came Buck-Taylor, who towered hugely above the tallest man in the palace, his long hair tied back on his shoulders; then came "Broncho Bill" in buckskin, and after him trooped the cowboys, splashed with mud and picturesque beyond description. "Rocky Bear" led the Sioux warriors in the rear. They were painted in every color that Indian imagination could devise, and every man carried something to present to the Medicine Man sent by the Great Spirit. "Rocky Bear" rolled his eyes and folded his hands on his breast as he stepped on tiptoe through the glowing sea of color. His braves furtively eyed the halberds and two-handled swords of the Swiss guards. The Indians and cowboys were ranged in the south corners of the Ducal hall. Buffalo Bill and Nate Salsbury were escorted into the Sistine chapel by the chamberlains, and were greeted by Gen. Sherman's daughter. A princess invited Col. Cody to a place in the tribune of the Roman nobles. He stood facing the gorgeous diplomatic corps, surrounded by Prince and Princess Borghese, Marquis Selurn, Princess Bandini, Duchess Grazoli, Prince and Princess Massino, Prince and Princess Ruspoli and all the ancient families of the city. 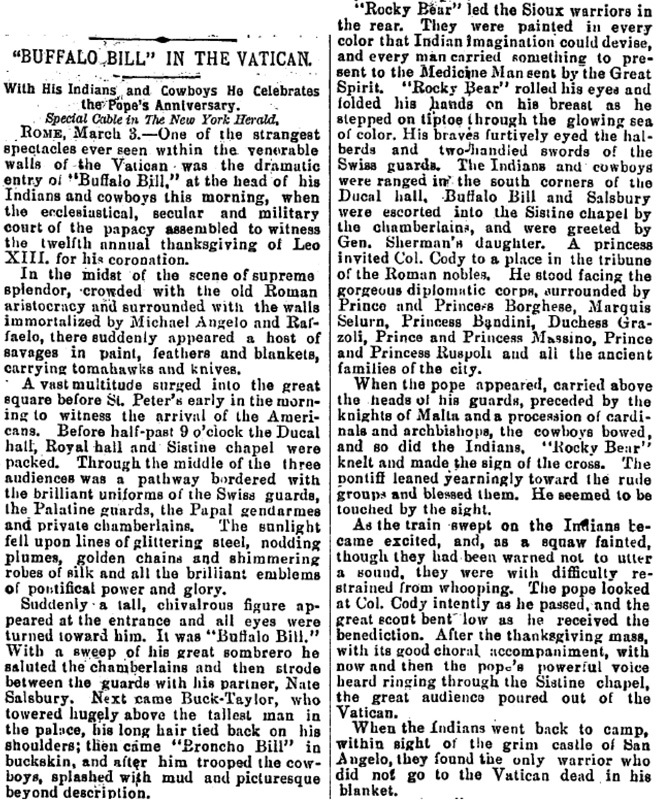 When the pope appeared, carried above the heads of his guards, preceded by the knights of Malta and a procession of cardinals and archbishops, the cowboys bowed, and so did the Indians "Rocky Bear" knelt and made the sign of the cross. The pontiff leaned yearningly toward the rude groups and blessed them. He seemed to be touched by the sight. As the train swept on the Indians became excited, and, as a squaw fainted, though they had been warned not to utter a sound, they were with difficulty restrained from whooping. The pope looked at Col. Cody intently as he passed, and the great scout bent low as he received the benediction. After the thanksgiving mass, with its good choral accompaniment, with now and then the pope's powerful voice heard ringing through the Sistine chapel, the great audience poured out of the Vatican. When the Indians went back to camp, within sight of the grim castle of San Angelo, they found the only warrior who did not go to the Vatican dead in his blanket. "Rocky Bear" told his followers that the Great Spirit had done it. To-night the Indians have temporarily relapsed into paganism and are howling over the dead brave, some of them tearing their flesh and sprinkling the funeral tent with the blood. Buffalo Bill expressed his delight at the way in which the company has been received. He said: "You see the Wild West is filling its mission of making history for the Indian and the Western man for the Columbus centennial of 1892, in showing the completion of his great efforts. So tell our friends in America that the 'Wild West' is all right. Let the carpers know that from time immemorial dogs have barked at the moon, but la lune still continues on the even tenor of her way."